Treatment of rheumatoid arthritis (RA) may differ among rheumatologists and currently, clear and consensual international recommendations on RA treatment are not available. In this paper recommendations for the treatment of RA with synthetic and biological disease-modifying antirheumatic drugs (DMARDs) and glucocorticoids (GCs) that also account for strategic algorithms and deal with economic aspects, are described. The recommendations are based on evidence from five systematic literature reviews (SLRs) performed for synthetic DMARDs, biological DMARDs, GCs, treatment strategies and economic issues. The SLR-derived evidence was discussed and summarised as an expert opinion in the course of a Delphi-like process. Levels of evidence, strength of recommendations and levels of agreement were derived. Fifteen recommendations were developed covering an area from general aspects such as remission/low disease activity as treatment aim via the preference for methotrexate monotherapy with or without GCs vis-à-vis combination of synthetic DMARDs to the use of biological agents mainly in patients for whom synthetic DMARDs and tumour necrosis factor inhibitors had failed. Cost effectiveness of the treatments was additionally examined. These recommendations are intended to inform rheumatologists, patients and other stakeholders about a European consensus on the management of RA with DMARDs and GCs as well as strategies to reach optimal outcomes of RA, based on evidence and expert opinion. While all these data of clinical and observational trials on drugs and strategies have been highly enlightening, patients and rheumatologists are currently overwhelmed by this information which does not always allow one to decide easily and conclusively which path to follow when initiating or changing therapeutic strategies in patients with RA. Indeed, some inconsistencies in therapeutic targets and strategies among rheumatologists have been recognised in a survey performed at a recent annual European Congress of Rheumatology.15 These inconsistencies may be partly based on differences in attitudes among doctors caring for patients with RA, settings (academic centres vs private practice), patient preferences and reimbursement policies. Information on the current state of evidence for the efficacy of different agents or therapeutic strategies may also not always be regarded as sufficiently complete or available. Along these lines, the European League Against Rheumatism (EULAR) has recently formulated major objectives, which among other aspects specify that “by 2012, EULAR will have provided standards of care and foster access to optimal care of people with musculoskeletal conditions in Europe”.16 Since disease modification constitutes the most important therapeutic intervention in RA, it was the objective of this EULAR Task Force to find a consensus on recommendations for the management of RA with synthetic and biological DMARDs. The task force aimed at aggregating available information on disease modification in RA into practical recommendations. The basis of the activities of the task force were the EULAR standardised operating procedures for the development of recommendations,17 which suggest the institution of an expert committee in charge of consensus finding on the basis of evidence provided by a systematic literature review (SLR) and expert opinion. The task of developing management recommendations for RA was regarded as large and therefore warranted division of the topic into five main areas: (a) synthetic DMARDs as monotherapy or in combination without GCs; (b) GCs alone and in combination with synthetic DMARD(s); (c) biological DMARDs; (d) treatment strategies; (e) economic issues. The last aspect was deemed important to understand the cost implications of treating RA by retrieving the existing evidence; the fourth area was intended to look at the best approaches to attain the therapeutic goals, define the term ‘strategy’ as a long-term plan of action to achieve that goal; and, most importantly, the first three areas were related to the evidence available for the efficacy, safety and monitoring of currently employed drugs. The recommendations will reflect the balance of efficacy and safety and will not deal in detail with the toxicity of DMARDs. The most important pieces of information in this regard are provided in separate publications on the SLRs,18,–,22 which indeed are part and parcel of these recommendations, since they provide their bases. Thus, the recommendations shown here will primarily deal with agents whose toxicity appears to be manageable, assuming that users are either aware of the respective risks or will adhere to the information provided in the package inserts. Also, where toxicity appears to be a major concern, a general warning will be included in the respective recommendation. The expert committee comprised 25 rheumatologists, two patients, one infectious disease specialist, one health economist and five fellows. The members of this task force came from 12 European countries and from the USA. The expert committee was divided into five subgroups; each consisted of five to seven members including one fellow and dealt with one of the above topics. At the first meeting, these subgroups prioritised the research questions, defined the appropriate search terms and reported to the full committee, which took the final decisions by consensus. At the second task force meeting, the fellows presented the results of the SLR in an aggregated form to the subgroups. The members of the subgroups debated and evaluated the evidence presented and formulated preliminary sets of recommendations. These proposals were reported to the entire task force, which discussed the suggestions on the recommendations in detail, amended them as deemed appropriate in the course of the consensus finding and took the final decisions. An ultimate round of refinement of the wording was done via electronic communication, by which also an anonymous voting on the level of agreement was performed. In addition, respondents were asked to indicate which of the statements were in line with their current treatment practice and, if not, whether they would change that practice. The task force started its work in December 2008 and finalised it in June 2009. Before dealing with the actual treatment recommendations, the task force discussed several principles that were deemed important to be conveyed to those with RA or involved with the management of RA. These principles for the care of patients with RA are of such generic nature that they were felt to be ‘overarching’ (table 1). The task force decided unanimously on these three principles. Rheumatologists are the specialists who should primarily care for patients with RA. This statement stems from the evidence that patients with RA followed up by rheumatologists, in comparison with other doctors, are diagnosed earlier, receive DMARD treatment more frequently and have better outcomes in all major characteristics of RA, in particular joint damage and physical function.24,–,28 Rheumatologists check the disease activity of their patients with RA with appropriate instruments and are well aware of the indications, contraindications and adverse effects of DMARDs; this has become of particular importance with the advent of modern treatments and strategies. Therefore, patients with inflammatory arthritis, in general, and suspected RA, in particular, should be referred to rheumatologists as early as possible, since a delay in such a referral is one of the most daunting causes of tardy institution of effective treatment.9 29 However, the task force intentionally added the term ‘primarily’ to this statement, since the management of patients with RA should be shared with primary care doctors and other health professionals in a multidisciplinary approach. Also, in countries lacking sufficient numbers of rheumatologists, this task may have to be taken over by other doctors with experience in caring for patients with RA. Treatment of patients with RA should aim at the best care and must be based on a shared decision between the patient and the rheumatologist. Two themes govern the contents of this principle—first, the term ‘best care’, which the task force felt to be conveyed by the subsequent recommendations, and second, the phrase ‘shared decision’ with the patient, which refers to the need to discuss treatment aims, management plans and reasons for the recommended approaches with the patient. RA is expensive in regards to medical costs and productivity costs, both of which should be considered by the treating rheumatologist. The expert committee wished to encapsulate that the direct and indirect costs of RA, especially if insufficiently treated, are very high.28 30,–,33 Modern treatments, particularly biological agents, are expensive,30 34 35 but may enable lowering of short- and long-term indirect costs of disease—an actuality that should be kept in mind for individual treatment approaches as well as reimbursement considerations. This underlying principle also reinforces the decision to evaluate economic aspects in relation to the individual recommendations to examine the cost effectiveness of RA treatment. In each subgroup, the members discussed the evidence provided by the fellows in their SLRs in detail and agreed on five to eight recommendations for the respective topic. These preliminary statements on the management of RA with synthetic DMARDs, GCs and biological agents, as well as on treatment strategies and economic aspects, were subsequently reviewed intensively by the whole task force, synthesised and voted upon. This process led to 15 recommendations on drug management and treatment strategies. Each of these 15 recommendations was then subjected to an economic valuation in accordance with the results obtained by the economics subgroup of the task force. The 15 recommendations (detailed in table 1) are presented in the text below in an abbreviated version. The levels of evidence and strengths of recommendation for each recommendation are then shown in table 2 and the economic valuation in table 3. The 15 recommendations are ordered by a logical sequence or procedural and chronological hierarchy rather than by any major weight of importance, with the exception of the first two points which constitute the foundation of all subsequent items. They also serve as basis for the algorithm provided in figure 1. Algorithm based on the European League Against Rheumatism recommendations on rheumatoid arthritis management. DMARD, disease-modifying antirheumatic drug; MTX, methotrexate; RF/ACPA, rheumatoid factor/anti-citrullinated peptide antibodies; TNF, tumour necrosis factor. *The treatment target is clinical remission or, if remission is unlikely to be achievable, at least low disease activity. MTX as initial choice—MTX is a highly effective drug for disease modification in RA,52 and more recent insights suggest that MTX at higher weekly doses (20–30 mg) is more effective than MTX at lower weekly doses (7.5–15 mg).2 53 MTX is considered the anchor drug in RA,54 both on the basis of its efficacy as monotherapy and on the basis of its ability to increase the efficacy of biological DMARDs when used in combination,55,–,59 as well as the beneficial long-term safety profile.60 MTX is effective in DMARD naïve patients with early RA,13 49 56 61 and its clinical efficacy has neither been surpassed by other synthetic DMARDs nor consistently by tumour necrosis factor (TNF) inhibitor monotherapy.37 55 56 62 For these reasons the task force considered that MTX should be instituted at the earliest time point in patients with RA. This statement comprises three items in addition to the recommendation for using MTX: first, it uses the wording ‘part of the first treatment strategy’, implying that MTX may have to be combined with other agents (see below); second, it refers to ‘active RA’, implying that patients with low disease activity may not necessarily need treatment with MTX; and third, the statement indicates implicitly that a strategy using MTX should be applied also to patients with active RA who have previously not received MTX, but only other synthetic DMARDs. Obviously this recommendation does not pertain to patients for whom a contraindication for MTX use is present (see below). Leflunomide, SSZ or injectable gold—There is currently insufficient evidence that leflunomide, SSZ or intramuscular gold salts are inferior to MTX.37 38 62,–,64 Nevertheless, because of the wealth of efficacy and safety data available for MTX, the three mentioned DMARDs should be used instead of MTX as first DMARD treatments mainly if there are contraindications to (or intolerance of) MTX. In analogy with the previous paragraph, these MTX alternatives should also be considered as a part of a treatment strategy. The rather prominent place of parenteral gold salts has been the subject of intensive debate, but can be justified by the currently available high-level evidence,63 65 66 and this decision was ultimately backed by the majority of the task force. In addition to the drugs mentioned above, antimalarial drugs (hydroxychloroquine and chloroquine) are also used in RA. They show some efficacy as monotherapy with respect to signs and symptoms67 and are frequently used as part of combination therapies.42 68 69 It is, however, not clearly established if antimalarial drugs confer additional efficacy in combination therapy. In addition, antimalarial drugs do not inhibit structural damage sufficiently, especially in comparison with other agents such as SSZ.70 Therefore they have not been mentioned more prominently in the recommendation statement. Nevertheless, on the basis of their clinical efficacy as monotherapy they may have some value in patients with very mild disease who have contraindications to other compounds. Synthetic DMARD monotherapy or combination therapy—Over the past two decades, combination therapy with various synthetic DMARDs has been suggested to convey superior efficacy in comparison with monotherapy.7 42 68 69 71 Results of clinical trials testing the addition of synthetic DMARDs to MTX in patients with residual disease activity despite MTX treatment have often been used to support the assumption of an added benefit72 73; however, in these studies an appropriate control (switch) arm was lacking and the proportion of responders receiving combination therapy did not exceed the proportion of responders receiving the monotherapy components.74 An important fact to consider to truly appreciate the content of this recommendation, however, is that in most clinical trials comparing combination therapy with monotherapy head to head, GCs were either mandatory in the combination therapy arm or GC use was different between both arms, which probably explains the superiority of combination therapy.74 Several other trials suggest that in the absence of GCs neither a start with combinations of synthetic DMARDs nor a step up combination therapy are better than monotherapies or switching DMARDs for the major outcomes.49 75,–,77 The SLR on this allowed a firm conclusion to be drawn.18 Furthermore, in DMARD naïve patients the balance of efficacy and toxicity favours MTX monotherapy versus combination therapy, while the evidence is inconclusive in DMARD inadequate responders.78 Therefore, the task force decided to use the word ‘may’ here. It is important to keep in mind that if combination therapy with synthetic DMARDs does not allow the treatment target to be achieved, it is impossible to disentangle which of the agents was insufficiently effective, precluding better usage of synthetic DMARDs. The statement contains yet another element—namely, the segment “irrespective of the addition of GCs”. The committee was unanimous in its opinion that the addition of GCs to either monotherapy or combination therapy with DMARDs improves outcomes. However, studies allowing a direct comparison of GCs plus DMARD monotherapy versus GCs plus combination DMARDs have not been done. Addition of a biological DMARD or switch to another synthetic DMARD—This statement introduces the importance of prognostic markers in treatment decisions in RA. Factors believed to predict bad outcome independently are (a) the presence of autoantibodies, that is, rheumatoid factor and/or anticitrullinated peptide antibodies, particularly at high levels; (b) high disease activity as measured by composite indices (DAS, DAS28, Simplified Disease Activity Index and Clinical Disease Activity Index), swollen joint counts or acute phase reactants (C reactive protein, erythrocyte sedimentation rate); (c) early occurrence of erosions83,–,87; these factors have recently also been amalgamated into a risk model.88 The task force agreed that patients failing to reach the treatment target on an initial strategy with synthetic DMARDs, in whom poor prognostic markers as defined above are absent, could be switched to another synthetic DMARD strategy for 3–6 months before further decisions on the institution of a biological agent are taken; these other DMARDs have been mentioned in recommendation 4. However, patients for whom an initial DMARD failed and who have poor prognostic markers should have the opportunity to receive a biological DMARD in addition to their synthetic DMARD. Interestingly, closing a gap of information by using a control arm receiving active treatment, a recent study which was not part of the SLR reported that for patients with early RA who had failed to reach low disease activity after 3 months' MTX monotherapy, the addition of a TNF inhibitor yielded significantly better clinical outcomes than the addition of SSZ plus hydroxychloroquine.89 These data also corroborate the conclusions discussed in recommendations 5 and 6—namely, that a combination of synthetic DMARDs in the absence of added GCs (even triple treatment of MTX, SSZ and hydroxychloroquine) has limited efficacy and may not have higher efficacy than if the patients had been switched to SSZ, as was shown in the BeSt trial.12 This limited (but partly exhibited) efficacy of such a synthetic DMARD regimen also supports the expert opinion of switching patients for whom a first DMARD strategy has failed and who do not have bad prognostic markers to another DMARD (or eventually DMARD combination). In contrast, for patients for whom initial MTX or other synthetic DMARDs (ideally with GCs) has failed and who have bad prognostic indicators a biological DMARD, in general, and a TNF inhibitor, in particular, should be employed. Importantly, however, no randomised controlled or observational clinical trials to date have tested this approach of differential treatment based on prognostic factors. Therefore, this statement is at the level of an expert opinion, but is supported by various indirect evidence provided in the existing literature. Initiation of a TNF inhibitor—This expansion of statement No 7, which applies to patients followed according to that previous statement, emphasises that biological agents are effective if synthetic DMARDs have failed (level 1a, grade A) and that they should be combined with MTX (or other DMARDs), since this combination has greater efficacy than monotherapy with most biological agents; this is well established for TNF inhibitors on the basis of respective comparative phase III trials55 56 and for rituximab and tocilizumab on the basis of comparative phase II trials58 59 (level 1b, grade A). At the time of the SLR, the only biological agents licensed in Europe for treating patients with RA with active disease despite synthetic DMARD treatment were the TNF inhibitors and tocilizumab; rituximab and abatacept are currently licensed only for use after failure of TNF inhibitors. In the USA, though not currently in Europe, abatacept can also be used in these former patients; in light of more recent clinical trial data,90 91 abatacept and rituximab may receive similar approval as first biological agents by the European regulatory authorities in due course. It is noteworthy that some TNF inhibitors such as adalimumab and etanercept are licensed as monotherapy on the basis of their efficacy in clinical trials, but the data on their clinical superiority compared with MTX monotherapy are partly mixed.55 56 92 Recent data suggest that monotherapy with tocilizumab is more effective than monotherapy with DMARDs such as MTX93 94; however, this RCT did not include a third arm using the combination of both so that it is not clear to date whether in patients with early RA monotherapy with tocilizumab is similarly or less effective than combination therapy with tocilizumab and MTX. Currently, the largest array of safety information is available for the TNF inhibitors owing to their use for more than one decade and the availability of large long-term registries. These compounds comprise adalimumab, etanercept and infliximab, but certolizumab and golimumab have meanwhile also been approved. However, it should be borne in mind that this represents current expert opinion and may change over time, specifically with the recent approval of other biological agents as potential first biological agent for DMARD inadequate responders—namely, tocilizumab in Europe and abatacept in the USA and other non-European countries. It should also be mentioned here that anakinra, the IL-1 receptor antagonist, while effective in individual patients with RA, did not show a high level of clinical efficacy in clinical trials95 96 and therefore has not been recommended as a major biological agent for use in RA. Azathioprine, ciclosporin A or cyclophosphamide—RA can run a course that is refractory to several DMARDs and biological agents and can be severely destructive and disabling.99 100 105 106 While in the previous recommendations four synthetic DMARDs and nine biological agents have been mentioned, allowing a variety of therapeutic options, refractoriness may and still will occur. In order to meet the needs of this group of patients, the task force has referred to agents for which the literature provides evidence on efficacy. However, one needs to bear the toxicity in mind, especially in the case of ciclosporin A and cyclophosphamide; the latter drug should only be used in exceptional situations. A number of presumed DMARDs were excluded here, because the evidence for their efficacy was deemed insufficient; these include D-penicillamine, minocycline, auranofin, tacrolimus and chlorambucil. With respect to antimalarial drugs we refer to the paragraph on recommendation 4. Intensive medication strategies—This statement supplements several of the previous recommendations on drug treatment. Advocating intensive medication strategies refers to content of the strategy, such as MTX plus GCs or MTX plus biological agents, as well as tight monitoring and rapid switching of treatments if treatment goals are not attained (benchmarking).12 107 The statement that patients with poor prognostic factors have more to gain finds its basis in the appreciation that patients with a favourable prognosis very often respond similarly to low-intensity monotherapy or intensive medication strategies,87 88 but that patients with a severe and aggressive disease course often do not respond sufficiently well to DMARD monotherapy or combination therapy without addition of GCs or biological agents. Tapering of synthetic DMARDs—This statement follows the preceding one, suggesting that tapering synthetic DMARD treatment in cases of longstanding remission could be considered after GCs and biological agents have been discontinued. Evidence supporting such an approach does not exist—neither details of a time frame nor dosing or interval duration during the tapering process. Thus, the means of tapering is left to the discretion of patient and doctor. However, in light of the available data showing that stopping DMARDs is associated with an increased flare frequency,108 110 the committee felt that tapering should be performed cautiously and assessed rigorously. Biological treatment in DMARD naïve patients While biological DMARDs, in line with statements Nos 7 and 8, should, in general, be applied to patients for whom synthetic DMARD(s) have failed, the committee strongly felt that there are some patients for whom first-line biological treatment combined with MTX has to be considered. Such patients will usually have unfavourable prognostic signs, including very active disease or early structural damage. Currently, only TNF inhibitors are licensed for such patients, but other biological agents may receive similar approval with more trial data in the future. When evaluating results of trials using TNF inhibitors plus MTX in MTX naïve individuals and studies of the same compounds in patients with active disease despite MTX treatment,1 55 56 61 111,–,113 patients naïve to MTX had higher response rates than MTX insufficient responders, but many of the MTX-naïve patients in the combination therapy arms would have responded to MTX monotherapy anyway. Thus, while, there is also additional evidence from strategic trials that employing TNF inhibitors plus MTX early is an effective treatment,36 49 more recent data suggest that this approach may not be more effective in patients with early RA than starting synthetic DMARDs first and adding a biological agent to the DMARD rapidly (in that study after 3 months) if active disease prevails.114 However, hitherto no clinical trial has examined the actual expert-based recommendations to use such a strategy in few, selected patients as described above. Indeed, this statement received the lowest level of agreement (8.0/10) and it was the only item for which a large number of rheumatologists stated that it was not their current practice and that this recommendation would change their practice. Adjustment of treatment—Prudence and knowledge will guide one to bear toxicity of agents and comorbidities in mind when prescribing drugs for RA. However, the rapidity of progression of joint damage, in addition to disease activity and other prognostic factors, may support decision-making in relation to statements Nos 7 and 14, especially if joint damage appears to progress considerably despite the achievement of the desired treatment target; however, lag periods47 have to be taken into consideration before making such decision. The cost effectiveness of the therapeutic measures recommended above has been assessed in detail by a dedicated SLR, which is also published separately.22 In sum, the available data suggest that all recommendations are known to be cost effective with the exception of statement No 14 (table 3). However, an economic analysis considering only the exceptional patients considered in recommendation No 14 has not been performed. The committee does not preclude the possibility that in this particular category of patients, the approach of starting biological agents as first-line DMARD treatment may be cost effective. Research questions have been formulated in all subgroups. These questions were assessed by the task force and the result of this discussion is summarised in table 4. The task force has formulated 15 brief statements on the management of RA with synthetic and biological DMARDs. These statements were mostly based on a SLR with consensus finding on the wording of the recommendations, but partly also solely based on expert opinion. By this process and by stating the respective level of evidence and strength of recommendation for each item, the committee adhered to the EULAR standardised operating procedures for the development of recommendations.17 Moreover, where evidence was lacking and the task force had to arrive at an expert opinion, a research agenda was formulated to expedite the generation of evidence in the future. The reasoning behind each statement and, particularly, behind the recommendations' specific wordings is explained in detail in the results section and will not be repeated here. Importantly, the overall agreement with these statements, assessed anonymously several weeks after their formulation, was very high with means of ≥8/10 for all and >9/10 for seven of the 15 items (statements Nos 1–3, 8, 9, 11 and 15). The lowest agreement (8/10) was received by the recommendation to start biological agents plus MTX as first DMARD strategy in selected patients with very high disease activity and poor prognostic markers (No 14). Indeed, it was also the only item where many rheumatologists stated that it was not their current practice and that this recommendation would change their current treatment practice (data not shown). Dividing the task into five specific areas may have helped unambiguous conclusions to be reached. Three of these areas were related to actual pharmacological treatment. Moreover, separating the SLRs on synthetic DMARDs into those with and those without addition of GCs facilitated the derivation of recommendations on combination therapy with a clarity that had previously been unappreciated; at the same time, this clarity raised new questions which require further elucidation. It is worth noting that the task force felt that the best evidence for efficacy was available for four synthetic DMARDs (MTX, leflunomide, SSZ and parenteral gold; statements Nos 3 and 4) and eight biological agents (adalimumab, certolizumab, etanercept, golimumab, infliximab, abatacept, rituximab and tocilizumab; statements Nos 7–9). These 12 agents are also clearly stated in the itemised recommendation sentences. Two additional agents are mentioned in the text only—namely, antimalarial drugs and anakinra, because while effective in RA, their efficacy is lower than that of other agents in their general class, synthetic or biological. A final group of DMARDs is referred to as a last resort for patients for whom the above drugs have failed (statement No 10). It should be mentioned here that GCs also have disease-modifying ability,80 but the task force does not suggest using them as monotherapy owing to their adverse event profile.81 Also, the readers are referred to the accompanying papers on the SLRs for full information on the efficacy of the respective agents. The task force was convinced that modern treatment of RA should be goal oriented and governed by a strategic treatment approach. Remission or at the least low disease activity should be the therapeutic goal, in line with a recent recommendation on treatment goals in RA.48 115 On the way to attaining this target, patients should be closely monitored using composite disease activity measures116 117 and treatment adapted in accordance with the current recommendation if the treatment aim is not reached within preferably 3, but at most, 6 months. The task force also felt strongly that, in general, DMARD treatment should be started with MTX at appropriately high doses, possibly with the addition of GCs for the short term, before other measures are taken if the therapeutic goal is not reached within a maximum of 6 months. The type of other measures should depend on prognostic factors: while biological agents may be considered in all patients after lack of achievement of remission or low disease activity on the above treatment, such treatment is of more importance in the presence of poor prognostic factors, like the presence of autoantibodies, a high disease activity state or early erosive disease; it was felt quite appropriate to consider alternative synthetic DMARDs in the absence of poor prognostic factors. However, the task force also voiced its opinion that occasional patients with a particular need for rapid, highly effective intervention, may benefit from starting a biological agent plus MTX as a viable and useful option. Particular emphasis emerged upon analyses of combination therapies with synthetic DMARDs. The SLR did not reveal general superiority of such combinations in comparison with respective monotherapies. Only in studies where GCs were added to synthetic DMARD(s) (or were given in higher doses or more frequently than in controls) was there compelling evidence for superiority of such combinations, but notably, the superiority was present regardless of whether GCs were added to synthetic DMARD monotherapy (such as MTX) or to combinations of synthetic DMARDs (such as triple treatment with MTX, SSZ and antimalarial drugs). GCs have a special place in the discussion (statements Nos 5, 6, 8 and12). On the one hand, with respect to all outcomes, their efficacy as monotherapy, but especially in combination with synthetic DMARDs is indisputable. On the other hand, their toxicity, particularly in the intermediate to long term, was considered to be significant,82 so they should be used with caution and for only short periods of time. Tapering of GCs, but also of biological agents and eventually synthetic DMARDs, was an area of discussion too (statement No 13), but there is currently insufficient evidence available about outcomes and potential risks and hence how to proceed in this regards. Therefore, the committee felt that tapering should only occur in cases of sustained remission and should be part of the research agenda. Figure 1 summarises the recommendations and the resulting algorithm. Phase I comprises the initiation of DMARD treatment once RA has been diagnosed (statements Nos 1–6). Phase II deals with patients who did not achieve the treatment target with strategy I (statements Nos 7 and 8); here, patients are stratified according to prognostic factors and this strategy contains the all steps until the use of the first biological agent. Phase III relates to patients for whom the first biological compound failed (statement No 9). The recommendations on the management of RA provided here by the EULAR Task Force are not the first of their kind. Indeed, EULAR has already published recommendations for early RA,115 but the present document relates to all patients with RA, rather than only those with early RA or undifferentiated arthritis and provides far more detail about pharmacological compounds. However, in line with the guidance document by Combe et al, the first bullet point calls for a DMARD to be initiated as soon as RA is diagnosed. Aside from the EULAR document on early RA management, the ACR has provided therapeutic recommendations for several years.118 However, its most recent 2008 recommendations are complex and may not fully cover several aspects of drug treatments and therapeutic strategies and goals.119 A comprehensive document published by the National Institute of Health and Clinical Excellence (NICE) of the UK29 at a time when our investigations were well advanced arrived at many conclusions that are supported by ours and vice versa, although the NICE publication does not consider biological treatments. Finally, many national rheumatological societies, such as the French or German societies, have published national guidance documents. These EULAR recommendations have been developed by task force members from 12 European countries and the USA. They are meant to serve rheumatologists in Europe and elsewhere, although we are aware that not all agents mentioned here are approved everywhere and, indeed, some agents had not yet been approved in Europe when we dealt with the respective literature, in the expectation that they would be licensed by the time this manuscript was submitted for publication. Beyond rheumatologists, the document is also provided for patients with RA to inform them about current treatment goals, strategies and opportunities, as recognised through the important participation of patients in the task force. Finally, this document is also meant for officials in governments, social security agencies and reimbursement agencies, since it provides the current state of thought in the area of RA management and is based on as much evidence as was available. In this regard, the economic valuation is also of significance; indeed, all recommendations are supported by cost-effectiveness data, with the exception of starting biological agents before synthetic DMARDs; indeed, this conclusion is further supported by a recent Cochrane meta-analyis which stated that in patients with early RA. biological agents plus MTX may not differ significantly from placebo plus MTX with risk ratios of 1.43 and 95% confidence intervals of 0.98 to 2.09.120 However, in this regard more research is needed, since the recommendation only pertains to limited exceptional patients whose treatment has not yet been studied economically. Indeed, several of the recommendations are more strongly based on expert opinion and on clinical practice that has emerged in certain institutions than on available evidence. It is here where the opportunity to garner evidence has to meet or disprove expert opinion or practice and this is in part, the driver for the research agenda. Also, as has been the case over the past decade, new data on existing or new drugs or therapeutic strategies will emerge over the next few years. Therefore, we will carefully watch developments in the field and assume that an amendment of these recommendations may be needed in 2 years. Finally, irrespective of availability or affordability of certain agents, these recommendations can also serve as a template for national societies which can adapt them to national clinical practices while remaining within their general framework.
. Combination DMARD therapy including corticosteroids in early rheumatoid arthritis. Clin Exp Rheumatol 1999;17 (6 Suppl 18):S59–65.
. Early referral recommendation for newly diagnosed rheumatoid arthritis: evidence based development of a clinical guide. Ann Rheum Dis 2002;61:290–7.
. For EULAR. The Eight EULAR 2012 Objectives. http://www.eular.org/myUploadData/files/Stene%20Prize%202009%20Booklet.pdf. 2009.
. Current evidence for the management of rheumatoid arthritis with synthetic disease-modifying antirheumatic drugs: systematic literature review informing the EULAR recommendations for the management of rheumatoid arthritis. Ann Rheum Dis 2010;69:1004–09.
. Current evidence for the management of rheumatoid arthritis with biological disease-modifying antirheumatic drugs: a systematic literature review informing the EULAR recommendations for the management of RA. Ann Rheum Dis 2010;69:976–986.
. Current evidence for a strategic approach to the management of rheumatoid arthritis with disease-modifying antirheumatic drugs: a systematic literature review informing the EULAR recommendations for the management of rheumatoid arthritis. Ann Rheum Dis 2010;69:987–994. Oxford Center for Evidence Based Medicine. Levels of Evidence, 2009.
. Progression of functional disability in patients with rheumatoid arthritis. Associations with rheumatology subspecialty care. Arch Intern Med 1993;153:2229–37.
. Differences in the use of second-line agents and prednisone for treatment of rheumatoid arthritis by rheumatologists and non-rheumatologists. J Rheumatol 1997;24:2283–90.
. Do primary care physicians have a place in the management of rheumatoid arthritis? Joint Bone Spine 2004;71:190–7.
. Costs, outcomes, and patient satisfaction by provider type for patients with rheumatic and musculoskeletal conditions: a critical review of the literature and proposed methodologic standards. Ann Intern Med 1997;127:52–60.
. Rheumatoid arthritis: direct and indirect costs. Joint Bone Spine 2004;71:518–24.
. An assessment of the annual and long-term direct costs of rheumatoid arthritis: the impact of poor function and functional decline. Arthritis Rheum 1999;42:1209–18.
. Disease-modifying antirheumatic drugs other than methotrexate in rheumatoid arthritis and seronegative arthritis. Curr Opin Rheumatol 2008;20:251–6.
. Sulfasalazine: a review of its use in the management of rheumatoid arthritis. Drugs 2005;65:1825–49.
. Efficacy and safety of leflunomide and predisposing factors for treatment response in patients with active rheumatoid arthritis: RELIEF 6-month data. J Rheumatol 2003;30:2572–9.
. Functional disability in relation to radiological damage and disease activity in patients with rheumatoid arthritis in remission. J Rheumatol 2002;29:267–70.
. Rheumatoid arthritis joint progression in sustained remission is determined by disease activity levels preceding the period of radiographic assessment. Arthritis Rheum 2009; 60:1242–9.
. Efficacy of methotrexate in rheumatoid arthritis. Br J Rheumatol 1995;34(Suppl 2):43–8.
. Sulfasalazine treatment for rheumatoid arthritis: a metaanalysis of 15 randomized trials. J Rheumatol 1999;26:2123–30.
. Comparative study of intramuscular gold and methotrexate in a rheumatoid arthritis population from a socially deprived area. Ann Rheum Dis 2001;60:566–72.
. A 48-week, randomized, double-blind, double-observer, placebo-controlled multicenter trial of combination methotrexate and intramuscular gold therapy in rheumatoid arthritis: results of the METGO study. Arthritis Rheum 2005;52:1360–70.
. Antimalarials for treating rheumatoid arthritis. Cochrane Database Syst Rev 2000;4:CD000959.
. Combination therapy versus monotherapy for the treatment of patients with rheumatoid arthritis. Clin Exp Rheumatol 1999;17:699–704.
. Sulphasalazine versus hydroxychloroquine in rheumatoid arthritis: 3-year follow-up. Lancet 1990;335:539.
. Suppress rheumatoid inflammation early and leave the pyramid to the Egyptians. J Rheumatol 1990;17:1115–18.
.; The Methotrexate-Cyclosporine Combination Study Group. Combination therapy with cyclosporine and methotrexate in severe rheumatoid arthritis. N Engl J Med 1995;333:137–41.
. Concomitant leflunomide therapy in patients with active rheumatoid arthritis despite stable doses of methotrexate. A randomized, double-blind, placebo-controlled trial. Ann Intern Med 2002;137:726–33.
. Superior efficacy of combination therapy for rheumatoid arthritis: fact or fiction? Arthritis Rheum 2005;52:2975–83.
. Methotrexate therapy in rheumatoid arthritis after failure to sulphasalazine: to switch or to add? Rheumatology (Oxford) 2009;48:1247–53.
. Effects of glucocorticoids on radiological progression in rheumatoid arthritis. Cochrane Database Syst Rev 2007;1:CD006356.
. Long-term outcome of treating rheumatoid arthritis: results after 20 years. Lancet 1987;1:1108–11.
. Diagnostic and prognostic significance of autoantibodies in early rheumatoid arthritis. Scand J Rheumatol 2005;34:83–96.
. Autoantibody profiling as early diagnostic and prognostic tool for rheumatoid arthritis. Ann Rheum Dis 2005;64:1731–6.
. Rituximab improved physical function and quality of life in patients with early rheumatoid arthritis: results from a randomized active comparator placebo-controlled trial of rituximab in combination with methotrexate compared to methotrexate alone in pat. Ann Rheum Dis 2009;68(Suppl 3):581.
. Golimumab in patients with active rheumatoid arthritis after treatment with tumour necrosis factor alpha inhibitors (GO-AFTER study): a multicentre, randomised, double-blind, placebo-controlled, phase III trial. Lancet 2009;374:210–21.
. Which subgroup of patients with rheumatoid arthritis benefits from switching to rituximab versus alternative anti-tumour necrosis factor (TNF) agents after previous failure of an anti-TNF agent? Ann Rheum Dis 2010;69:387–93.
. When patients with rheumatoid arthritis fail tumour necrosis factor inhibitors: what is the next step? Ann Rheum Dis 2008;67:1497–8.
. Differential responsiveness to immunoablative therapy in refractory rheumatoid arthritis is associated with level and avidity of anti-cyclic citrullinated protein autoantibodies: a case study. Arthritis Res Ther 2007;9:R106.
. Interleukin-2 diphtheria fusion protein (DAB486IL-2) in refractory rheumatoid arthritis. A double-blind, placebo-controlled trial with open-label extension. 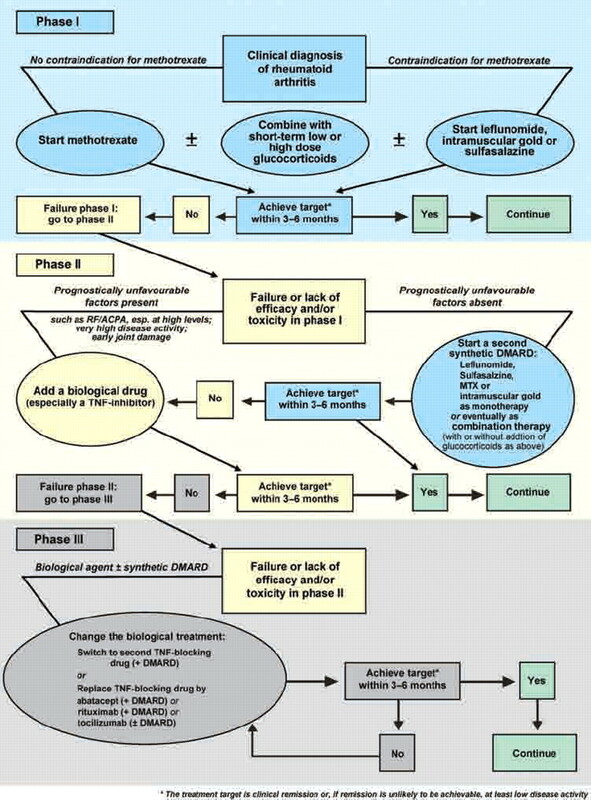 Arthritis Rheum 1995;38:1177–86.
. A proposed treatment algorithm for rheumatoid arthritis: aggressive therapy, methotrexate, and quantitative measures. Clin Exp Rheumatol 2003;21(5 Suppl 31):S209–10.
. Withdrawal of DMARDs in patients with rheumatoid arthritis: a systematic review and meta-analysis. Ann Rheum Dis Published Online First: 17 February 2009 doi:10.1136/ard.2008.105577. JSS and RL are joint first authors. Competing interests The following authors declare that they have no potential conflict of interest: CG-V, SG, RK, MK, JN, MS, JW. The following authors declare a potential conflict of interest having received grant support and/or honoraria for consultations and/or for presentations as indicated; JSS: Abbott, Amgen, BMS, Centocor, Pfizer, Roche, Schering-Plough,UCB, Sanofi-Aventis, Wyeth; RL: Abbott, Amgen, BMS, Centocor, Merck, Pfizer, Schering-Plough, UCB, Wyeth; FCB: Abbott, Schering-Plough, Wyeth; MD: Pfizer, Wyeth, Abbott, Roche, Novartis, Nordic Pharma, BMS, UCB; PE: Abbot, BMS, Centocor, Pfizer, Roche, Schering-Plough,UCB, Sanofi-Aventis, Wyeth; MS: Abbott; DA: Abbott, Roche, Schering-Plough, BMS, UCB, Sanofi-Aventis; MB: Roche, Abbott, BMS, Wyeth; LG: Abbott, Schering-Plough, Roche, UCB, BMS, Wyeth; TH: Schering Plough, BMS, Biotest, Wyeth, Novartis, Roche, Sanofi-Aventis, Abbott, Axis-Shield; JWJWB: Abbott, Roche, Wyeth, Schering Plough, Merck, Pfizer, UCB, BMS; GB: Abbott, Wyeth, Schering-Plough, Roche and UCB; BC: Abbott,BMS, Roche, Schering, UCB,Wyeth; MC: Sanofi-Aventis, BMS, Pfizer, Abbott; CG: Roche, BMS, Abbott, Essex, Wyeth, UCB; JG-R: Abbott, BMS, Pfizer, Roche, Schering-Plough,Wyeth and UCB; TKK: Abbott, BMS, Roche, Schering-Plough,Wyeth, Pfizer, MSD and UCB; EMM: Wyeth/Pfizer, Roche, Abbott Schering Plough/MSD; IM: Schering Plough, Pfizer, Roche and BMS; KP: Roche, Abbott, BMS, Pfizer, MSD; PvR: Abbott, BMS, Roche, Sanofi-Aventis, Schering-Plough, UCB, Wyeth; DLS: MSD, Pfizer, Novartis, Roche, Wyeth, Novartis, Schering Plough; TS: Abbott, Pfizer, Sanofi-Aventis, Roche, UCB; GV: Abbott, BMS, Roche, Sanofi-Aventis, Schering-Plugh, UCB, Wyeth; RvV: Abbott, Pfizer/Wyeth, Roche, Schering-Plough, BMS, UCB; KLW: Amgen, Wyeth, UCB, Genentech; AZ: Abbott, Amgen, BMS, Essex/Schering-Plough, Merck, Pfizer, Roche, Sanofi, UCB, Wyeth; DvdH: Abbott, Amgen, BMS, Centocor, Chugai, Merck, Pfizer, Roche, Schering-Plough,UCB, Wyeth. Francis Berenbaum was the Handling Editor.